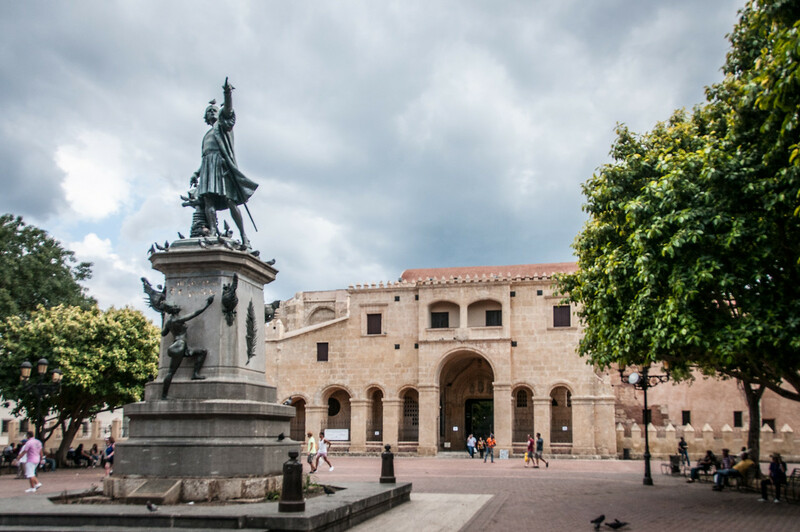 After the arrival of Christopher Columbus on the island of Hispaniola in 1492, Santo Domingo became the site of the first cathedral, hospital, customs house and university in the Americas. This colonial town was laid out on the grid pattern that became the model for almost all town planners in the New World. The first impression of the Spanish colonizers was favorable: nature was luxuriant; the aborigines were friendly, and it seemed that the ground was rich in gold. Using what was left of the Santa María, Columbus built the fort of the Nativity (Navidad) on the northern coast of the island not far away from a peak that he called Christi Mount, leaving 39 men there under the protection of the village head. When Columbus returned to Hispaniola a year later, the fort had been destroyed, his men were dead, and the aborigines had become mistrustful. He founded a new colony further to the east, which he called Isabella, and left it under the control of Bartholomew. However, the first revolts were very soon to begin. In 1496, Bartholomew abandoned Isabella in order to move on the southern coast of the island, where he established the settlement of Nueva Isabella, now Santo Domingo, on the left bank of the Ozama River. Because of the insurrections that continued to upset the island, Columbus was replaced as Viceroy and Governor of the colony by Nicolás de Ovando. In 1502 a typhoon destroyed the city and the fleet that was preparing to return to Castile. Ovando decided that the city should be completely rebuilt on its present site on the Ozama. This colonial town was laid out on the grid pattern that became the model for almost all town planners in the New World. The city was to be embellished with a cathedral, a hospital, convents, a fortress, and a university. At that time it was not appropriate to describe these buildings as having been built in the colonial architectural style because they were all based on plans that faithfully followed models imported from Spain. Earthquakes and pirate attacks were in due course to ravage the main buildings of the city, such as the convents of the Dominican, Franciscan and Las Mercedes, the three religious orders that pioneered the evangelization of the New World, and the Hospital of Nicolás de Ovando. Among the most outstanding buildings, the cathedral was constructed between 1514 and 1542; it is the oldest in America and is one of the architectural wonders of the Colonial City. The main entrance stands next to the Columbus Plaza, where stands a giant statue of the great navigator himself. The fine stained glass is by the famed Dominican artist José Rinçon Mora. 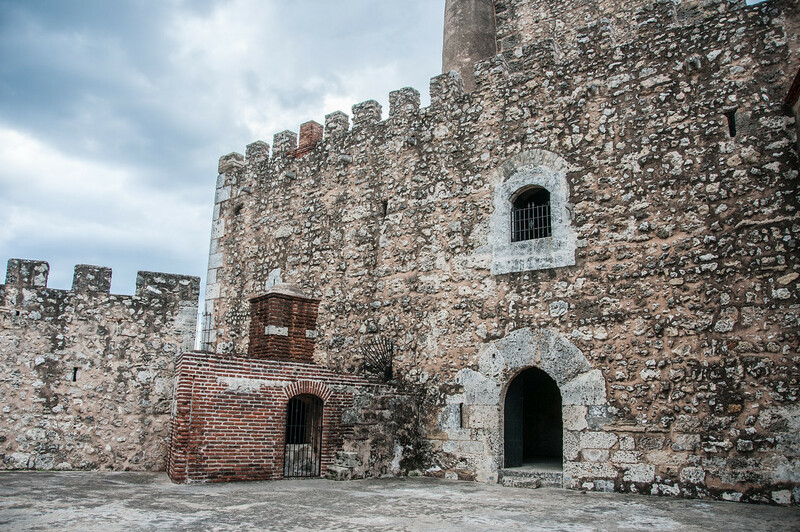 The Ozama Fortress and Tower of Homage were built in 1503: this stone group is said to be the oldest formal military outpost still standing in America. The Tower of Homage still stands in the center of the grounds, an impressive architectural structure that is medieval in style and design. 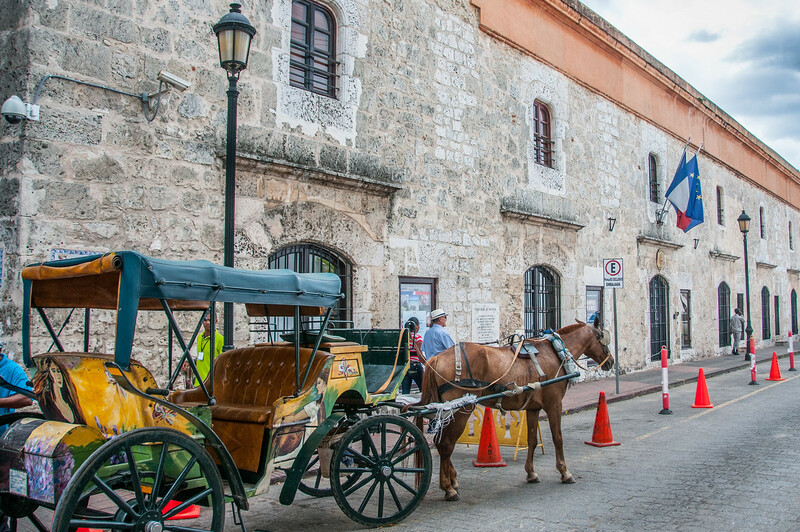 Santo Domingo is the oldest colonial city in the western hemisphere, which in and of itself is probably reason alone to be placed on the world heritage list. Santo Domingo is pretty easy to visit. The colonial zone (aka the old city) is right where cruise ships dock. It is also the location of a large cluster of the tourist hotels in Santo Domingo. There are two parts of the old city that I would recommend. The old fortification (seen above) still has parts which are standing. This is what originally guarded the harbor. I’d also make sure to visit Christopher Columbus Square, which is the heart of the old city. Here you will find many cafes, restaurants, and the cathedral. The Colonial City of Santo Domingo is a cultural UNESCO World Heritage Site in Dominican Republic. It was inscribed in 1990 and spans a total land area of 106 hectares. This city is considered of universal cultural significance as it marks as an early colonial settlement in the New World. The city was established in 1498. In addition, the Colonial City of Santo Domingo is also home to the first cathedral and monastery in the Western Hemisphere. In addition to these, the first hospital, first court of law, and first university in this part of the world was established here as well. The historic enclave that is this city is therefore undeniable; hence, UNESCO recognized its value and named it a World Heritage Site in order to preserve that value. The Colonial City of Santo Domingo in the Dominican Republic is an urban landscape steeped in colonial history. This historic neighborhood is also considered the oldest permanent European settlement within the Americas. It is commonly referred to as the “Colonial Zone”. The geographical location of the colonial center is on the western side of the banks of the Ozama River. The Colonial City of Santo Domingo is currently a popular tourist attraction. It remains to be that way even though most of the government sites and commercial activity have been transferred to other parts of the city. The first history of settlement in Santo Domingo was established on the east bank of Ozama River. It was Bartholomew Columbus who established that settlement. But after the hurricane of 1502 that claimed the lives of many victims, the city was transferred to the western bank of the river, which is now its current location. This particular settlement was used by the Spaniards in order to establish the first point of influence within the Americas. From there, they used the city as a base to conquer other islands in the Caribbean along with mainland America. Santo Domingo served as the political and cultural center of the Spaniard colonial presence in the New World. 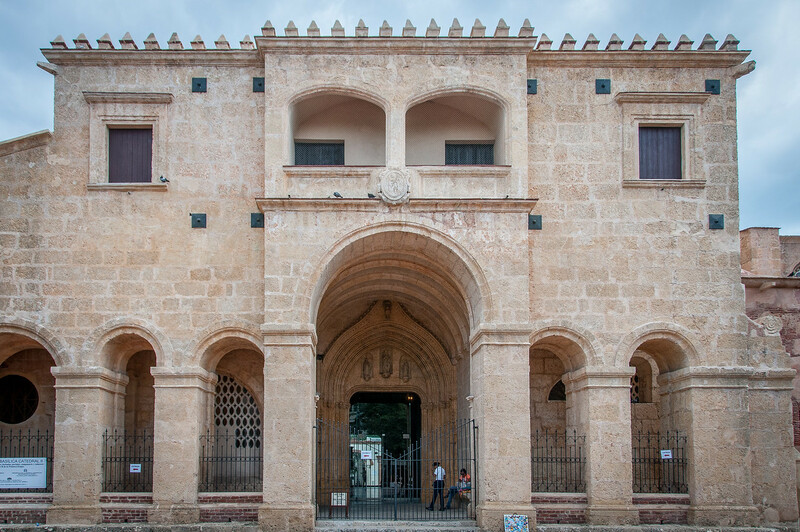 Alcazar de Colon: This is the oldest Viceregal residence in the Colonial City of Santo Domingo. This building is where you will find the Museo Alcazar de Diego Colon. This palace is notable for its use of coralline blocks during construction. 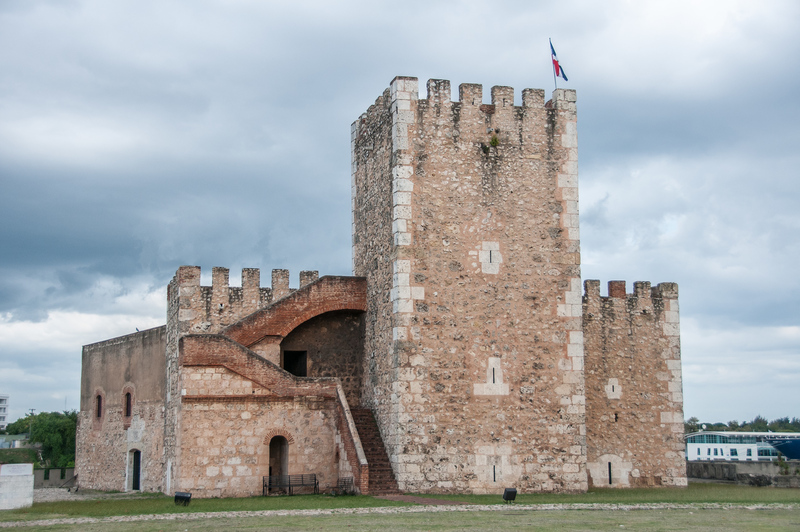 Fortaleza Ozama: This castle was built in 1502 and is located by the entrance to Santo Domingo. This castle provides an overlooking view of the Ozama River, to which the castle was named after. This is known as the oldest military fortification that was built in the Americas by the Europeans. Catedral Primada de America: Located within the Colonial Zone of Santo Domingo, this cathedral is dedicated to St. Mary of the Incarnation. It is the oldest cathedral in the Americas. The construction for the cathedral begun in 1502 and was completed in 1540. Parque Colon: This is a square located within the Colonial City of Santo Domingo. It is one of the most important squares in the city’s colonial zone. It borders the 16th-century Cathedral and the Christopher Columbus statue that was built in the 19th century. Calle del Conde: This is a pedestrian-only street that is home to many notable historical buildings, some of which were built during the early 20th century. It is also connected to Parque Colon. Calle Las Damas: This is another important landmark within the colonial city because it is the oldest paved road in the New World. It was constructed in 1502. View my complete list of UNESCO World Heritage Sites in Dominican Republic.